State: Species member of the threatened "Lowland Riverine Fish Community of the Southern Murray Darling Basin" under the Flora and Fauna Guarantee Act 1988. Deep body with strongly tapered snout and protruding lower jaw in larger fish. Large mouth with a gape extending back to below the middle of the eye. Conspicuous open pores in the lower jaw. Rounded tail fin. Colour varies with habitat, upper body varies from dark brown, dark green, almost black to olive-green, bronze, gold, yellow or cream, becoming lighter to yellow or white on the lower sides and belly. Strong lateral line, which is very prominent on the rear half of the body. Pectoral fins are usually yellow, other fins vary in colour from dusky to yellowish or cream, sometimes with reddish or white edges on the lower and tail fins. Occurs naturally in Victorian tributaries of the Murray-Darling system, except higher altitude streams. Introduced into a number of other waters, streams and lakes, including Green Lake near Horsham and Wannon River near Hamilton. Variety of environments, but occurs most frequently in warm, turbid, sluggish inland waters and associated backwaters and billabongs. Can grow to 75 cm in length and 23 kg in weight, but is commonly less than 5 kg. A tolerant fish, being able to withstand water temperatures of 4 to 37°C, and salinities of 33,000 p.p.m. (almost that of sea-water). Natural spawning is reported to occur at night from spring to summer when water temperatures are between 23 and 26°C. Spawning appears to be influenced by rises in water level and increased day-length. Adult fish will move considerable distances upstream to spawn. Does not usually spawn in dams unless water levels are manipulated. Grows well in farm dams, where rapid growth rates have been observed: 43 cm in five years. Carnivorous, eating mainly crustaceans, insects, molluscs, with small fish such as goldfish and carp forming a large part of the diet in some areas. Feeding behaviour varies, with some individuals remaining in shaded areas or amongst weeds to take prey as it passes; other fish move slowly over weed beds to feed. 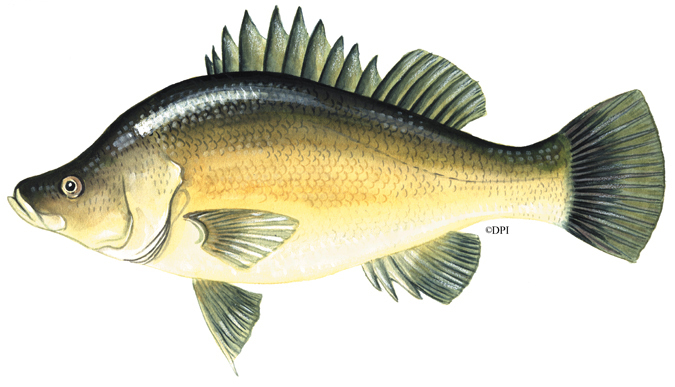 Golden perch is a significant component of the Department's native fish stocking program, with considerable numbers being purchased each year from commercial fish farms to stock rivers and lakes to restore existing populations or establish new recreational fishing populations in suitable waters. Some of these stocked waters are outside the natural range of the species. An important recreational and commercial species, golden perch is now bred in hatcheries for stocking public waters and private waters such as farm dams. A species that is growing in popularity with anglers, caught readily on bait and lures, although it is a spasmodic biter. Flesh is firm and tasty with excellent eating qualities. Distribution and abundance have been affected by environmental changes such as those caused by dams and weirs which have affected stream flows and water temperature regimes and acted as barriers to extensive migrations of adult fish. Recreational Fishing Licence requirements, and the regulations affecting the taking of Macquarie perch in Victoria, are provided in the Victorian Recreational Fishing Guide, available free from RFL sales agents and DEDJTR Offices and Information Centres.